Chapter 7, Effective Language Education Practices and Native Language Survival (pp. 95-106), edited by Jon Reyhner. Choctaw, OK: Native American Language Issues. Copyright 1990 by NALI Board of Executors and Jon Reyhner. Rock Point Community School is located in the middle of the Navajo Nation in Northeast Arizona. English-as-a-second-language (ESL) instruction was started at Rock Point in 1960 and bilingual instruction in 1967. In 1972, to provide "quality Navajo education through local community control," the community elected a school board which contracted with the Bureau of Indian Affairs, United States Department of the Interior, to operate it as a K-6 elementary school so they could have more control over hiring and curriculum. In 1976, one grade a year was added so that in 1982 the first high school seniors were graduated. Today the community continues to contract to operate the school under Public Law 638, the Indian Self-determination and Assistance Act. Forty-three per cent of Rock Point students in 1988 were dominant Navajo speakers while only five per cent were dominant English speakers. Under the Rock Point bilingual curriculum instituted in 1967, kindergarten students are taught reading in Navajo. Students add English reading instruction starting in second grade. In order to get enough Navajo language teachers, most of the Rock Point elementary school teachers were hired locally without college degrees, but an on-site training program brought college level courses to Rock Point and has led to many earning degrees. The school board and administration concluded that the only way an isolated Navajo community could get a stable teaching staff would be to hire and train local people (Rosier & Holm, 1980). The years have proven this conclusion right. In 1989, twenty-one teachers out of a teaching staff of fifty had worked ten years or more at Rock Point, and only one non-Navajo teacher was employed in the elementary school. Teachers without four year college degrees are required to take twelve semester credits each year leading towards an appropriate education degree. Over the past twenty-five years, the school has also had exceptional school board and administrative stability. The principal of the Bureau of Indian Affairs School, Wayne Holm, became the director of the new contract school and remained working at the school until 1986. In addition to Navajo teaching staff, another important aspect of the Rock Point Bilingual Program is the fact that the Navajo portion of the curriculum does not depend on supplemental funding, although Title VII bilingual funding was first received in 1971 and other funding has helped out. Navajo language teachers in grades K-12 are paid from the same main contract funds that most English language teachers are paid from. The bilingual program at Rock Point has been described as being both a coordinate and a maintenance bilingual program. Instruction in the two languages is kept separate but complementary. Instruction is not repeated in each language, but concepts introduced in Navajo are reviewed in English. Some teachers teach only in English and others only in Navajo. In kindergarten, two-thirds of the instruction is in Navajo with the rest of the time spent teaching students oral English. By second grade students are receiving half their instruction in English and half in Navajo. In the upper grades from fifteen to thirty per cent of the instruction is in Navajo with the rest in English. The amount of time spent teaching in Navajo and in English in grades K-6 at Rock Point is outlined in Figure 1. In the early grades, mathematics is taught first in Navajo and then the specialized English vocabulary is taught later (Rosier & Holm, 1980). By teaching content area subjects in the early grades in Navajo, Rock Point students are not held back in those subjects until they learn English. Concepts learned by students in Navajo are transferable and usable later in either language, and almost all basic reading skills learned in the Navajo reading program transfer into the English reading program [see Thonis (1981) for evidence of the transfer of reading skills from Spanish to English]. In 7th and 8th grade, students have one period of Navajo studies plus a quarter of Navajo writing each year. In grades 9-12 students have a half year of Navajo studies plus a quarter of Navajo writing each year. Eighth graders and seniors must give graduation speeches in Navajo and/or English. School testing programs that recognize linguistic and cultural differences and that search out student strengths rather than being used to track minority students into special education programs. (for further elaboration of these areas see Cummins, 1986; 1988; 1989). Cummins (1981) found that exposure to television, schooling, and English-speaking children can get Indian students speaking English fairly well in about two years as can transitional bilingual programs which usually are found in the first three or four grades. However, such speaking skills are "context-embedded," meaning that the situation that is being talked about is familiar to the student. Many classroom situations after grade four, especially those involved with reading textbooks, are "context-reduced," meaning that all the information must be gained from lectures or textbooks. The academic competence to understand English in a "context-reduced" situation takes an average of five or six years to learn (Cummins, 1989). Under the old submersion or new transitional bilingual approaches, Indian students often experience so much failure in school that they tend to give up and drop out, never catching up to their white peers. In maintenance bilingual programs such as Rock Point's, ESL instruction is spread over the entire elementary grades and students are given the time needed to gain context-reduced English language skills. Cummins also found many studies reporting "that bilingual children are more cognitively flexible in certain respects and better able to analyze linguistic meaning than monolingual children" and that bilingual education can reinforce students' cultural identity and reduce their mixed feelings about the dominant society (1981, p. 37). A frequent criticism of maintenance bilingual programs is that they delay the learning of English. However, Krashen (1985) has found the reverse to be true: The proper use of the first language can help the acquisition of English a great deal; well-organized bilingual programs are very effective in teaching English as a second language, often more effective, in fact, than all-day English programs that 'submerse' the child in English. (p. 69) Older grammar-based ESL-only programs were also found by students and teachers to be boring (Spolsky, 1978). ESL-only instruction has been seen as a quick fix to the shortage of bilingual teachers. However, ESL teachers need extensive training which involves knowledge of the structure of the native language of their students and a background in the students' culture. No generic ESL training can provide competent teachers for all minority language groups (Schaffer, 1988). High quality subject matter teaching in the first language, without translation. Development of literacy in the first language. Teachers at Rock Point have to produce many of their own materials to teach in Navajo. Bernard Spolsky's (1973) detailed survey found a "good bit" of Navajo language material around, but not enough "to fill out a first grade year of reading" (p. 31 ). Although there is now considerably more material, schools still must also rely on student and teacher made materials. The Navajo Reading Studies Project, which produced a considerable amount of Navajo material, ceased operation, and funding for similar projects is no longer available. At present a Title VII (bilingual education) funded Junior Research Program (JRP) in the elementary school and a Title V, before 1989 known as Title IV, (Indian education) funded Applied Literacy Program (ALP) in the secondary school at Rock Point develop student writing skills in Navajo and English. Students write for newspapers and booklets that then become reading material for other students. ALP and JRP are integral to the Rock Point bilingual program. These programs provide literacy instruction with a purpose for Rock Point students and encourage students to develop communication skills in Navajo and English. In the ALP program in grades 7-12, students spend a quarter each year in Navajo writing, English writing, computers, and performance. Each quarter, an award winning bilingual school newspaper is produced by the ALP program (see Figure 2). 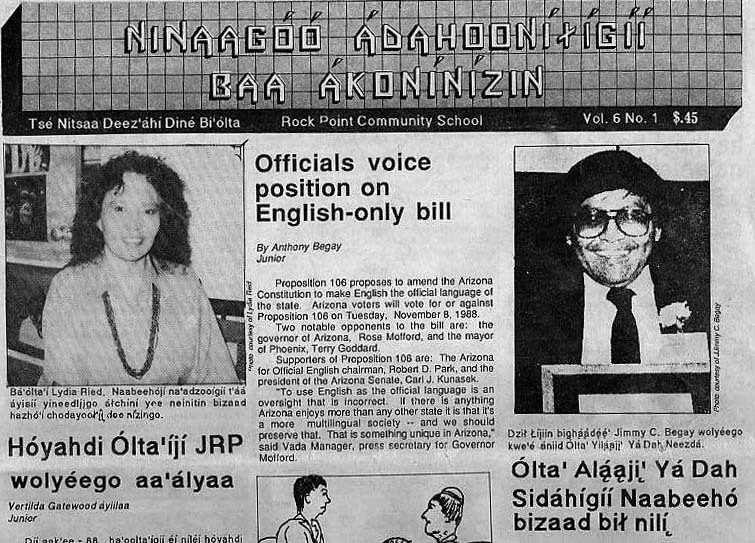 Students learn to type both Navajo and English in the computer class and the newspaper is now typeset and laid out with Macintosh computers. In the performance class students learn to use video equipment, and they give speeches and act in both Navajo and English. Their productions are broadcast on the school's low wattage television station. Figure 2: Front page of the October 1988 edition of the Rock Point Community School's high school newspaper. The Navajo title translates "Recognizing the things happening around us." In the JRP program students in grades 2-6 have Navajo writing, English writing, computers, and drama. Like the secondary school, the elementary students produce a school newspaper using Macintosh computers. In the drama class they produce public service skits which have been broadcast on the tribal 50,000 watt AM radio station. In addition to the above programs, hands-on instructional approaches--such as Stern Mathematics that emphasizes the use of manipulatives and Science: A Process Approach that emphasizes hands-on, experimental activities--are used in the elementary school because they lend themselves to adaptation by teacher for Navajo language instruction more readily than exclusively textbook approaches. They also provide the "realia" that Hoffman (1988) and the "context" that Cummins (1989) feel are essential for second language instruction. The community, teachers, and administrators at Rock Point were very concerned that the bilingual program lead to greater academic achievement in English as well as reading and writing skills in Navajo. In evaluating the program, the decision was made to use standardized tests to evaluate how well Rock Point students did in comparison to students in surrounding schools, in the state, and in the nation (Rosier & Holm, 1980). In 1983, Rock Point students by eighth grade outperformed Navajo student s in neighboring public schools, other Navajo speaking students throughout the reservation, and other Arizona Indian students in reading on the California Achievement Test. On the grammar (written English) portion of the test, the results were much the same. In mathematics, the Rock Point students did even better, outperforming the comparison groups and approaching and sometimes exceeding national averages (Holm, 1985). The 1987-88 school year California Test of Basic Skills (CTBS) test results show that Rock Point students continue to do equally well as or better than other Chinle Agency students at almost all grade levels in reading, language arts, and math, while criterion referenced testing shows they continue to improve their Navajo language skills (Rock Point, 1988). A Navajo language evaluator and an English language evaluator are employed in the elementary school to periodically test students on criterion referenced tests for both English and Navajo educational objectives to insure they are learning. Students who do not achieve mastery on these tests are referred to itinerant teachers who are employed for the exclusive purpose of providing remedial instruction. Remedial instruction is usually temporary, and students continue to attend their regular classes. The excellent test results obtained by Rock Point students were not achieved overnight. They are the result of students attending for twelve years a community-based, community-supported comprehensive K-12 maintenance bilingual program which has undergone continuous development and refinement since the first bilingual program was started at Rock Point in 1967. In addition to test scores, the success of bilingual education at Rock Point is indicated by student attendance rates above 94% for the last eight years and parent conference attendance rates above 80%. Parent involvement at Rock Point is a high priority. Parent activities include quarterly parent-teacher conferences, a yearly general public meeting held in November, an eight-member elected parent advisory committee that formally observes the school several times a year, school sponsored cultural e vents, and community dinners (Rock Point, 1988). Unlike surrounding public school districts which have arbitrary straight-line boundaries and schools that draw students from multiple communities, Rock Point Community School draws it students from a single community represented by the Rock Point Chapter, a division of the tribal government. The Rock Point Chapter house and the Rock Point Trading Post are all centrally located within the Chapter near the school. The fact that the school is relatively small with about 300 elementary students and 150 secondary students and draws from a relatively homogeneous community reduces some of the social problems such as drugs and alcohol that are serious in many reservation schools (for the advantages of small community-based schools (see Holm, 1989; Kleinfeld, et . al., 1985). In the elementary school's Navajo social studies curriculum, in addition to teaching tribal history, geography, and government, time is spent on Navajo clanship where students learn how they are related to other Navajos and the duties they owe to their clan relatives. During clanship week students wear slips of paper showing the clans of their mother, father, grandmother, and grandfather, and they greet each other with traditional kinship greetings. Thus, through the school's curriculum, community cohesiveness is reinforced. The Rock Point bilingual program continues to develop. As gradually an increasing number of students come to school dominant in English, a two-way program is being developed in which students who do not know how to speak Navajo are tutored in Navajo until they can participate fully in the Navajo part of the curriculum. Older programmed approaches to reading and ESL are being gradually replaced. More Whole Language activities are being introduced in reading including emphasizing reading for pleasure in and out of school. Big Books in English have been introduced into first and second grade and students are read to on a daily basis. Classroom libraries have been established in grades K-6 and students participate in a variety of literacy activities including Sustained Silent Reading (SSR). In ESL instruction, an activity oriented approach is being experimented with that emphasizes a project approach to science and other subjects. Funding is being sought for further development of Navajo reading material, since such material is necessary for the Navajo reading program, but at this date no such funding has been found and students are the only ones producing new material through their Navajo writing activities. Notes: I would like to thank the Rock Point Community School Board and the school's director, Jimmie C. Begay, for giving me the opportunity to work as the assistant director for academic programs at Rock Point during the 1988-89 school year while I was on leave from Eastern Montana College. In addition, I would like to thank the principals--Johnson Dennison, Stella Tsinajinnie, and Dan McLaughlin--and the teachers and support staff at Rock Point Community School for their commitment to Navajo bilingual education. Parts of this paper are based on the author's chapter on bilingual education in Teaching the Indian Child: A Bilingual/Multicultural Approach published by Eastern Montana College in 1986. Cummins, Jim. (1981). The Role of Primary Language Development in the Promoting Educational Success for Minority Students. In California State Department of Education, Schooling and Language Minority Students. Los Angeles: California State University at Los Angeles. --------. (1986). Empowering Minority Students: A Framework for Intervention. Harvard Educational Review, 56, 18-36. --------. (1988). Empowering Indian Students: What Teachers and Parents Can Do. In J. Reyhner (Ed. ), Teaching the Indian Child: A Bilingual Multicultural Approach (2nd Ed.) (Chapter 20, pp. 301-317). Billings, MT: Eastern Montana College. --------. (1989). Empowering Minority Students. Sacramento, CA: California Association for Bilingual Education. Hoffman, Edwina. (1988). Practical suggestions for Oral Language Development. In J. Reyhner (Ed. ), Teaching the Indian Child: A Bilingual Multicultural Approach (2nd Ed.) (Chapter 6, pp. 86-96). Billings, MT: Eastern Montana College. Holm, Wayne. (1985, February). Community School Charts Achievements. Indian Affairs, 108, 2-3. --------. (1989). On the Role of a Navajo Tribal Education Agency in Navajo Education. Journal of Navajo Education, 6(3), 38-54. Kleinfeld, Judith S., McDlarmid, G. W., & Hagstrom, D. (1985). Alaska's Small Rural High Schools: Are They Working? (Abridged Edition). Anchorage, AK: Institute of Social and Economic Research and Center for Cross-Cultural Studies, University of Alaska. (ERIC Document, ED 264 989). Krashen, Stephen D. (1985). Inquiries & Insights. Hayward, CA: Alemany. --------., & Tracy D. T. (1983). The Natural Approach: Language Acquisition in the Classroom. Hayward, CA: Alemany. --------., & Biber, D. (1988). On Course: Bilingual Education's Success in California. Sacramento, CA: California Association for Bilingual Education. Rock Point Community School. (1988). Internal Evaluation Report. Rock Point, AZ: Author. Rosier, Paul., & Holm, Wayne (1980) Bilingual Education Series: 8; The Rock Point Experience: A Longitudinal Study of a Navajo School Program (Saad Naaki Bee Na'nitin). Washington DC: Center for Applied Linguistics. Schaffer, Rachel. (1988). English as a Second Language for Indian Students. In J. Reyhner (Ed. ), Teaching the Indian Child: A Bilingual Multicultural Approach (2nd) (Chapter 7, pp. 97-116). Billings, MT: Eastern Montana College. Spolsky, Bernard. (1973). The Development of Navajo Bilingual Education. ERIC document, ED 094 559. ---------. (1978). American Indian Bilingual Education. In Bernard Spolsky and Robert L. Cooper (Eds. ), Case Studies in Bilingual Education. Rowley, MA: Newbury House. Thonis, E. W. (1981). Reading Instruction for Language Minority Students. In California State Department of Education, Schooling and Language Minority Students. Los Angeles: California State University at Los Angeles.